New York City – Todd Eldredge, Kristi Yamaguchi, Brian Boitano, Kimmie Meissner, and siblings John and Sinead Kerr are all superstar skating Olympians with an impressive resume of spectacular moves on the ice. 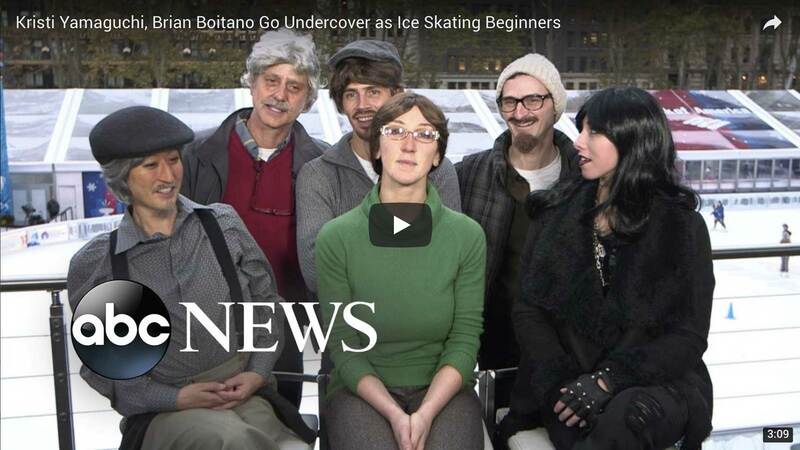 But this morning, viewers watched as the group undertook a special mission: to go undercover for “Good Morning America” and convince people that they were ice skating novices. The undercover operation unfolded in the middle of a skating class at the Bank of America Winter Village at Bryant Park in Manhattan. “GMA” brought together audience members and college students for the class Thursday morning. Wearing disguises that altered the appearance of their bodies and even their gender, the elite skaters took to the ice and hesitated, wobbled and demonstrated general ineptitude. Their apparent difficulties convinced their unsuspecting classmates. After a while, an announcer asked the public to clear the ice and then the six Olympians stayed behind, revealing their skill with a spectacular group routine. Sinead Kerr also received offers for assistance. “A couple of times people were trying to help and I was like, ‘Oh, I feel bad,’” she said. Her brother said he actually knew a few people at the venue. “So I was trying to shield myself from them. But I think a few of them were starting to get wind of it, so you know. It was fun,” he said. The Olympians will shed their disguises when they appear in the first special of the Colgate Skating Series, “Musselman’s Apple Sauce Family Skating Tribute,” on Sunday at 3 p.m., EST, on ABC.